Julia Meltzer is a filmmaker living in Los Angeles. Her film and video work has been broadcast nationally on POV and exhibited at the Whitney Biennial, the Sharjah Biennial, The Toronto International Film Festival, and the Rotterdam International Film Festival. Over the past decade, she has worked extensively in Syria, teaching and producing and directing films. Meltzer is a recipient of grants from the Rockefeller Media Arts Fellowship, the John Simon Memorial Guggenheim Foundation Fellowship, and she was a Senior Fulbright Fellow in Damascus, Syria in 2005–6. She has taught at Hampshire College, UC Irvine and Cal Arts. She received her BA from Brown University and her MFA from Rensselaer Polytechnic Institute. Laura Nix recently co-wrote CALIFORNIA STATE OF MIND: THE LEGACY OF PAT BROWN. Her non-fiction work has been shown on HBO and the History Channel, in addition to international DVD distribution. She is the writer/director of the narrative feature THE POLITICS OF FUR, which played in over 70 film festivals internationally, and won numerous awards including the Grand Jury Prize at Outfest. In 2001, Laura co-founded the production company Automat Pictures, where she directed dozens of presentations, including the feature documentary WHETHER YOU LIKE IT OR NOT. As producer, she made the festival hit THE YES MEN FIX THE WORLD about the political activist duo, and is currently producing their next film, THE YES MEN ARE REVOLTING. Monique Zavistovski is the winner of the 2006 INSIGHT award for Excellence in Editing for her work on The Shape of Water, narrated by Susan Sarandon. Monique recently completed Circus Rosaire, which premiered at Slamdance and won Best Feature Doc and Audience Awards at the Sarasota, Memphis, Arizona, Swansea Bay, England, and Ft. Lauderdale Film Festivals. In 2009 she edited The Legend of Pancho Barnes and the Happy Bottom Riding Club, which won a 2011 Emmy Award and the Best Editing award at DOCUTAH, and worked with award-winning producer Evangeline Griego on her feature, God Willing, in conjunction with ITVS. Monique’s latest project, From the Shadows, has garnered international media attention and is a verite style doc about parental child abduction to Japan. Born in Damascus, Kinan was the first Arab to win the premier prize at the 1997 Nicolai Rubinstein International Competition, Moscow. A graduate of New York’s Juilliard school, and of both the Damascus High institute of Music and Damascus University’s School of Electrical Engineering, Kinan is currently finishing his doctoral work in music at the City University of New York. Nathaniel has been editing both commercial and documentary projects for 9 years. He has cut content for Warner Brothers, AOL, MTV, Bravo and Sundance. He also edited WHETHER YOU LIKE IT OR NOT: THE STORY OF HEDWIG, a full-length behind-the-scenes feature on the making of the film HEDWIG AND THE ANGRY INCH. He is a graduate of the UCLA Radio, Television and Film program. Claire recently edited the feature doc California State of Mind: The Legacy of Pat Brown and was assistant editor on The Yes Men Fix the World. She was associate producer and assistant editor on Egypt: We are Watching You, produced for BBC World as part of the Why Democracy project and aired in 180 countries. She also edited for Comedycentral.com and has produced and edited numerous fine art film and video pieces. Lena was born and raised in Los Angeles by parents from Egypt and Syria. She graduated from USC in 2009 with a double major in International Relations and Art History and has traveled and volunteered throughout India, China and Southeast Asia. She is currently working for Project Concern International on an international women’s empowerment program. Itab Azzam is a producer and translator based in London. She was an Assistant Producer on Syrian School, a five-part series on Syrian schools which was broadcast on the BBC. She is a programmer for Reel Festivals, which just produced the first Syrian, Lebanese, and Scottish Film Festival. 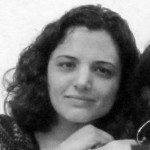 Yasmin Fedda is a filmmaker, translator, editor and community video coordinator based in both the UK and the Middle East. She is also a co-ordinator of Reel Festivals, a series of film, music, art and literature festivals that focus on areas of conflict behind the headlines. Yasmin has worked on a wide variety of projects from charity promotional films, youth film projects, indpendent documentaries and on art and TV productions. Yasmin is currently pursuing a PhD in Peace-building and Documentary Film. Nawara Mahfoud is a Syrian journalist and translator currently based in London. She has a BA in English Literature from Homs University and a MA in Journalism from City College, London. Marwa is a graduate of UC Irvine in Psychology. She was born in Aleppo, Syria and grew up in New Jersey in a large Syrian family. She lives in Irvine with her husband and two daughters. Please join the Light In Her Eyes community by signing up for our email list below. We will keep you up to date on upcoming screenings, DVD availability and more!